The global digital commerce platform market is currently being driven by the rise in use of consumer electronics and internet connectivity, which is the primary factor facilitating the growth of digital media and the ecommerce sector. The global digital commerce platform market is also finding a massive scope of growth due to the evolving cloud computing services that are making it easier and faster for consumers to avail digital content. The players in this market are also focusing on Asia Pacific for a greater scope of opportunities due to the current digital revolution in this region, coupled with the giant consumer electronics users in China. However, the global digital commerce platform market is being restricted by factors such as a lack of marketing skills shown by players due to the nascent stage of the market, and the growing safety and security concerns regarding the use of spyware and malware. The global digital commerce platform market was valued at US$4.44 bn in 2015. After expanding at a CAGR of 14.8% within a forecast period from 2016 to 2024, this market is expected to reach US$15.30 bn by the end of 2024. The global digital commerce platform market can be segmented on the basis of regions, into North America, Europe, Asia Pacific, The Middle East and Africa, and Latin America. Of these, North America provided the market with the leading demand volume as well as revenue generation for 2015. The market for digital commerce platforms in North America is projected at a CAGR of 13.7% within a forecast period from 2016 to 2024. This region owes its lead to a massive existing base of digital media users, powered by a high use of smartphones and high-speed data networks and internet services. This region is currently showing a phenomenal growth within the global digital commerce platform market in its B2B business model segment, while the North American retail segment has already been a prominent source of revenue for the market players. In 2015, Asia Pacific came second in terms of revenue generation in the global digital commerce platform market, followed by Europe, South America, and the Middle East and Africa respectively. 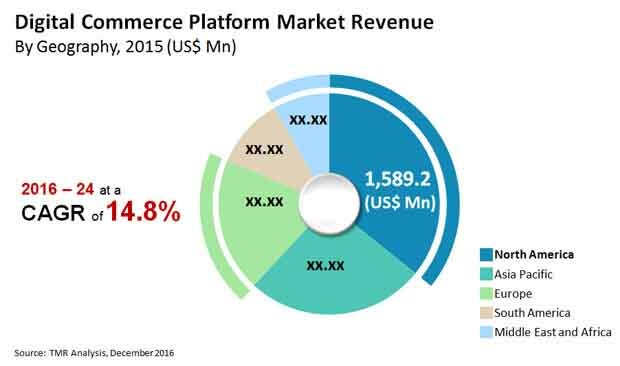 The digital commerce platform market in Asia Pacific is growing at a very fast pace due to changing consumer preferences and improved path to purchase due to the growing use of digital commerce platforms by its urban populace. Asia Pacific is also expected to maintain its growth due to a growing demand for advanced digital commerce technologies. Based on business model, the global digital commerce platform market is segmented into business to consumer, consumer to business, business to business, and consumer to consumer. In 2015, business to consumer segment was a highly preferred business model in digital commerce and accounted for close to 68.5% of the total market’s revenue. Based on deployment models, the market for digital commerce platform is segmented into on-premise, software as a service, fully managed and open source. In 2015, the on-premise segment held the leading share of 68.2% of the total revenue. This segment is also expected to retain its lead over the coming years. Software as a service is expected to show a high grade of promise in the global digital commerce platform market and is likely to continue expanding at the leading CAGR in terms of revenue from 2016 to 2024. In 2015, the leaders of the global warehouse management systems market included IBM Corporation, Hybris AG, Oracle Corporation, Magento, Inc., Demandware, Inc., CloudCraze Software LLC, Digital River, Inc., NetSuite Inc., Apttus Corporation, and Elastic Path Software Inc. This report intends to provide a comprehensive strategic analysis of the global digital commerce platform market along with revenue and growth forecasts for the period from 2014 to 2024. With advancements in digital commerce platforms and rising demand for Internet based commerce in retail, the digital commerce platform market is expected to experience high growth in the coming decade. Some of the factors supporting the growth of the market worldwide include the emergence of digital commerce and increased technological investment such as cloud in developed regions such as North America. Also factors such as increasing awareness of cloud based digital commerce platforms, high demand for digital commerce from retail sector and growing demand from developing regions such as Asia-pacific due to changing consumer preferences are also fuelling the growth of market. The impact of these and other macro-micro economic factors have been analyzed while developing the market growth models. This research study on the global digital commerce platform market provides a detailed analysis on digital commerce platform deployed for different applications by end-users depending upon their needs. The study explains the penetration within each market segment across various geographies, and how these segments have accelerated the growth of the market as a whole. It includes a comprehensive coverage of the underlying economic and technological factors influencing the digital commerce platform market growth. The report offers an in-depth study of the market drivers, restraints, and growth opportunities. Using these factors, the study identifies various trends prominent in the industry and are expected to influence the market growth during the forecast period from 2016 to 2024. The report provides the competitive landscape of key players in the digital commerce platform market in order to highlight the state of competition therein. It also provides a detailed competitive analysis of the key players in the market and identifies various business strategies adopted by them. The global digital commerce platform market is analyzed by segmenting it on the basis of business model, deployment model and end-users. The business model segment covers, the market is classified into business to consumer (B2C), business to business (B2B), consumer to business (C2B), consumer to consumer (C2C). Based on deployment model covers on-premise, software as a service, fully managed and open source. In terms of end-users, the global digital commerce platform market is segmented into BFSI, retail, IT and Telecommunication, airline & travel and others which include entertainment, education etc. Geographically, the global market for digital commerce platform has been segmented into five regions: North America, Europe, Asia Pacific, Middle East and Africa (MEA), and South America. The market size and forecast for each region has been provided for the period from 2014 to 2024 along with the CAGR (%) for the forecast period from 2016 to 2024. The study also includes quantitative analysis of the competitive scenario for major countries/regions such as the U.S., Canada, the U.K., Germany, France, Spain, Italy, UAE, Saudi Arabia, South Africa, Japan, India, Australia and Brazil. The analysis by business model, deployment model, end-users and regions helps in evaluating the present scenario and growth prospects of the digital commerce platform market over the forecast period from 2016 to 2024. A list of strategies have been provided for existing market players to take strategic decisions and strengthen their market position in the global digital commerce platform market. The report concludes with the profiles of major players in the digital commerce platform market on the basis of various attributes, such as company overview, SWOT analysis, segment presence, financial overview, business strategies, and recent developments. The major players profiled in this report include IBM Corporation, Oracle Corporation, Hybris AG, Demandware, Inc., Magento, Inc., Digital River, Inc., CloudCraze Software LLC, Apttus Corporation, NetSuite Inc. and Elastic Path Software Inc., among others.